Weslaco Crime Stoppers, Inc., is a non-profit tax-exempt organization dedicated to bringing criminals to justice. This is accomplished through the use of a coordinator provided by the Weslaco Police Department. This officer receives tips about crime and relays the information to the appropriate investigative agency, whether it be his department’s criminal investigations division, the Hidalgo County Sheriff’s Office, the Department of Public Safety, or another law enforcement organization. All calls are kept confidential, with callers assigned a code number so that they may remain anonymous. They are not asked to testify in court. When an arrest and/or indictment of a suspect occurs, the coordinator, with the approval of the Crime Stoppers Board of Directors, pays a reward to the informant in cash. Rewards range from $50 to $1,000, depending on the seriousness of the crime. Crime Stoppers started in Albuquerque, New Mexico, in 1976. A police detective, named Greg MacAleese, was working on a murder case, did a re-enactment, and publicized a reward, offered by a local civic organization. A tip was called in, a suspect was arrested, and the reward was paid. Thus Crime Stoppers was born. Weslaco Crime Stoppers was founded in 1989 by a group of concerned Weslaco businesspersons who felt that our city needed to do more to fight crime. A tragic crime in late 1988 was the catalyst that moved these citizens to action. On Sunday night, November 13, 1988, Evan Squires, age 70, and his wife, Wilda, age 65, were asleep in their mobile home in Magic Valley Trailer Park, when they were apparently awakened by a noise. They confronted intruders in their home and were both shot to death in cold blood. For years, no arrests were ever made in the case. However, in late 2011, Weslaco investigators were advised of a DNA match to a suspect from Michigan. The man, Arturo Almaguer, was tried in late January 2014 and found guilty of the double murder. On February 3, 2014, Almaguer was sentenced to 2 consecutive life sentences. Weslaco Crime Stoppers, as a state-certified Crime Stoppers program, shares monthly probation fees from the Hidalgo County district courts with seven other county programs. Eighty percent (80%) of this money has to be used for rewards payments. Because these fees are shared among so many programs, the amount each month is minimal. Other funds must be acquired through donations and fund-raising projects, to supplement the probation fees and to provide operating expenses. www.weslacocrimestoppers.com . We are also on Facebook. 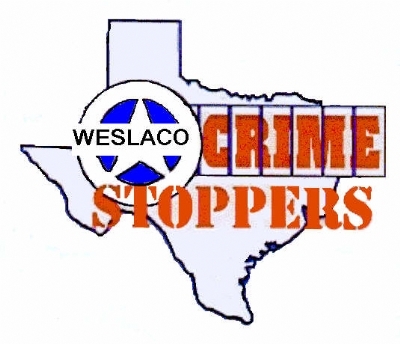 The Mission of Weslaco Crime Stoppers is to make Weslaco a safer and more pleasant place to live and work in by soliciting tips on crime and paying cash for that information, in order to help law enforcement solve felony crimes. The Weslaco Crime Stoppers organization is governed by an 18-member board of individuals who either live or work in Weslaco. There are 4 officer positions: President, Vice-President, Secretary, Treasurer.